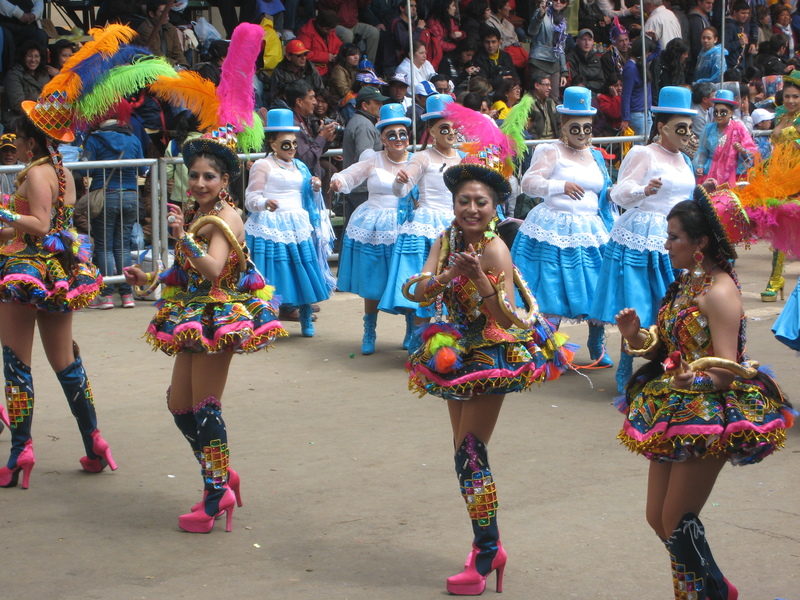 Carnaval is celebrated throughout Latin America, the most renowned being Rio de Janeiro`s Mardi Gras. 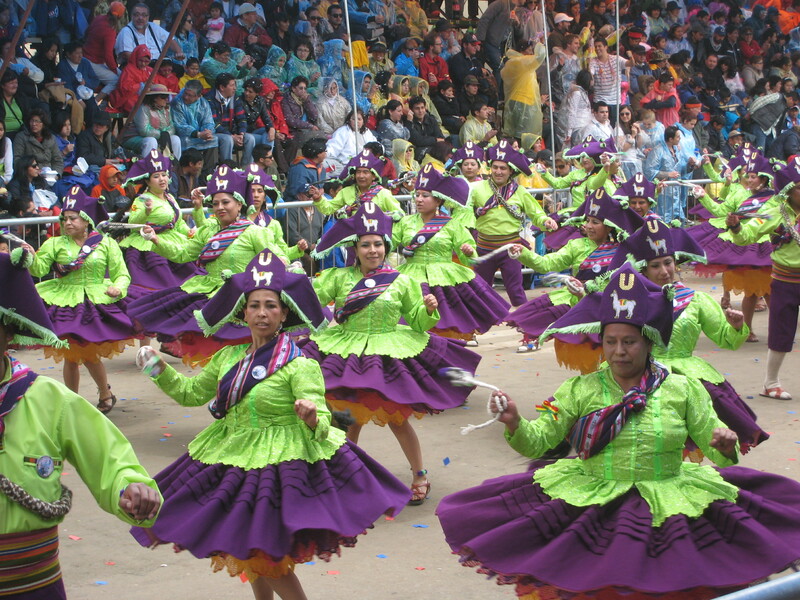 In Bolivia, Carnaval is a lavish affair with the biggest festivities taking place in Oruro, a sleepy mining town that bursts into life every February to host thousands of dancers and spectators. 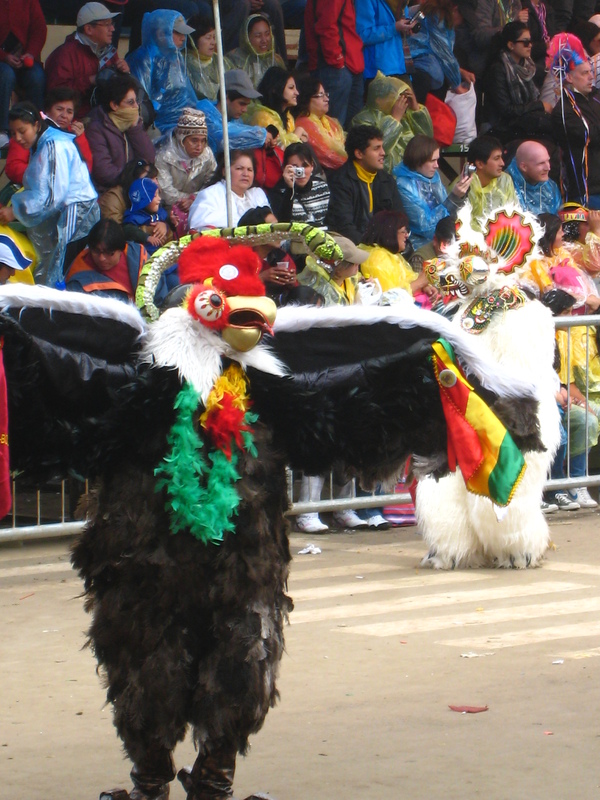 On the Friday preceding Carnaval, a ch`alla (blessing) is offered to Pachamama (Mother Earth) in the workplace to bring about good luck. At FONCRESOL, this involved draping colourful streamers around the office and showering the floors with alcohol and confetti. 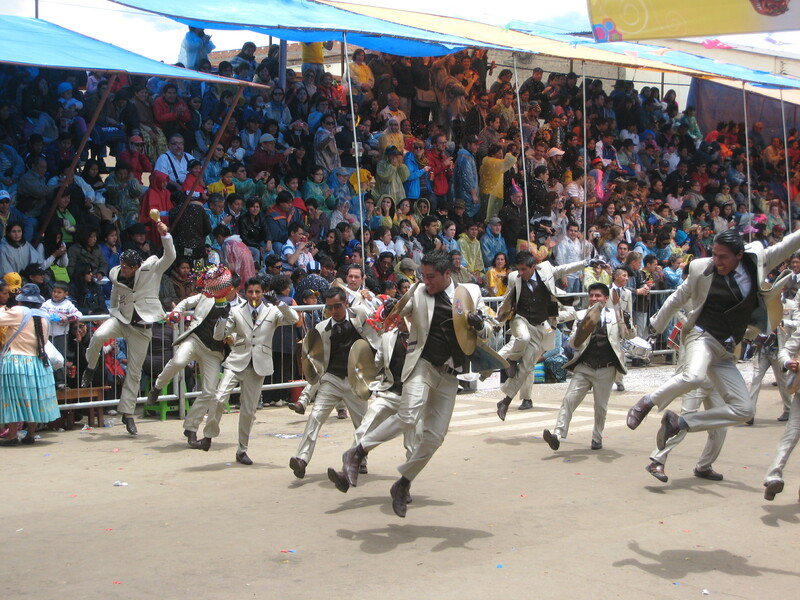 Similar ch`allas take place in homes on Shrove Tuesday, when the celebrations come to a close. 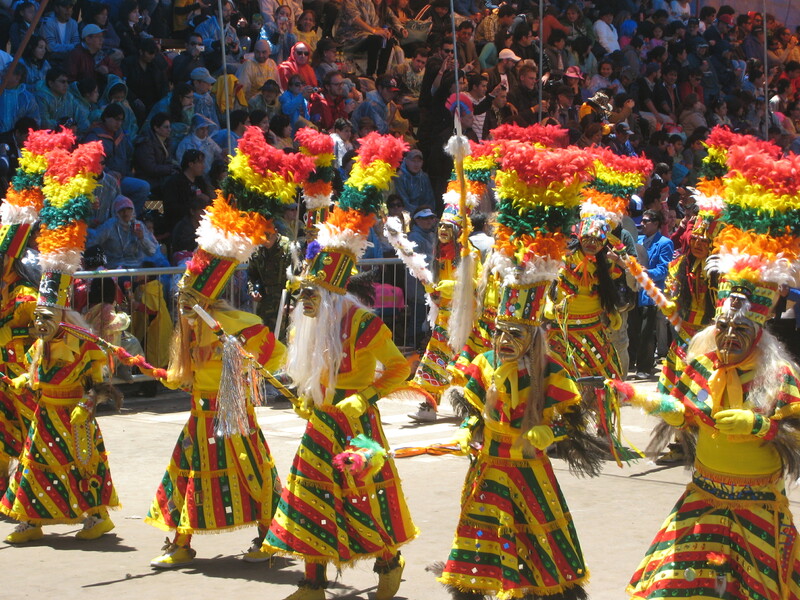 Upon many recommendations, I headed to Oruro with a friend for the renowned Saturday entrada, a day-long procession of indigenous dances in elaborate costumes. 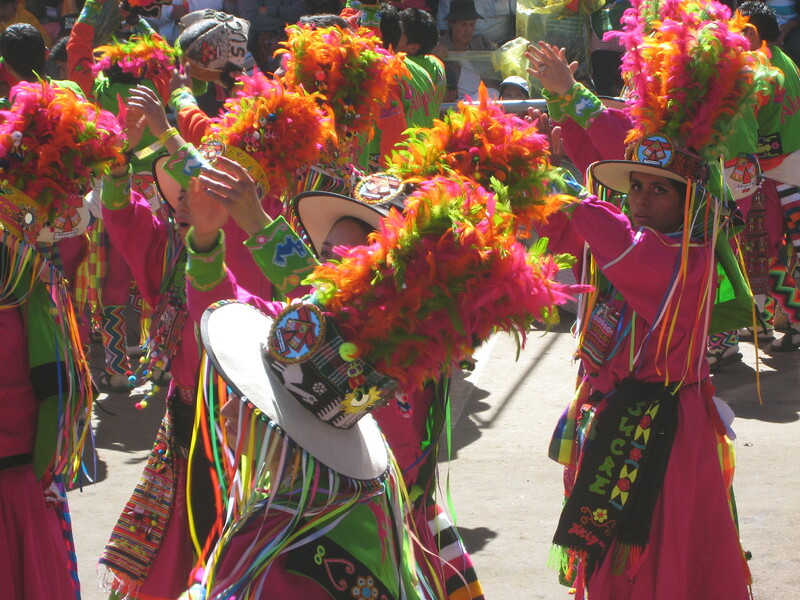 I left La Paz at dawn, joining the masses of Carnaval-bound paceños and tourists. The 4am bus was packed and the bus station overflowing. 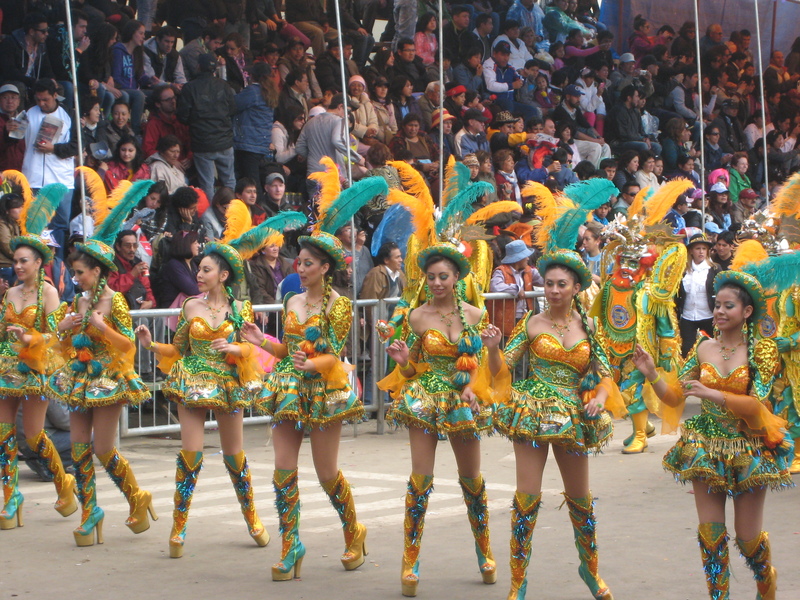 Arriving bleary-eyed at 8am, the dancing in Oruro was already in full swing. We picked our way through the crowds, dodging drunken revellers stumbling about, presumably still going strong from the previous night. The streets were lined with rafters, sectioned off with seats for sale, and after negotiating a price we settled in for the day. 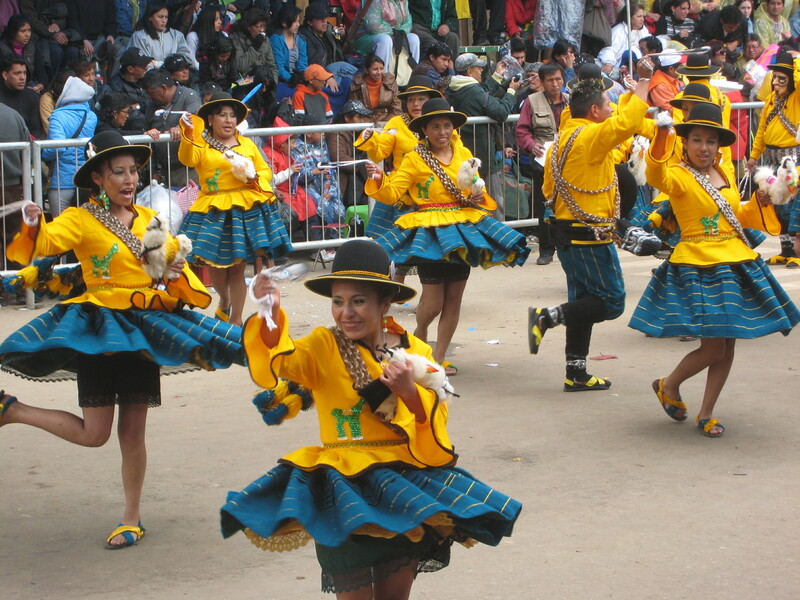 Each folk dance, with its own distinct music and costume, represents a specific aspect of Bolivia`s history. 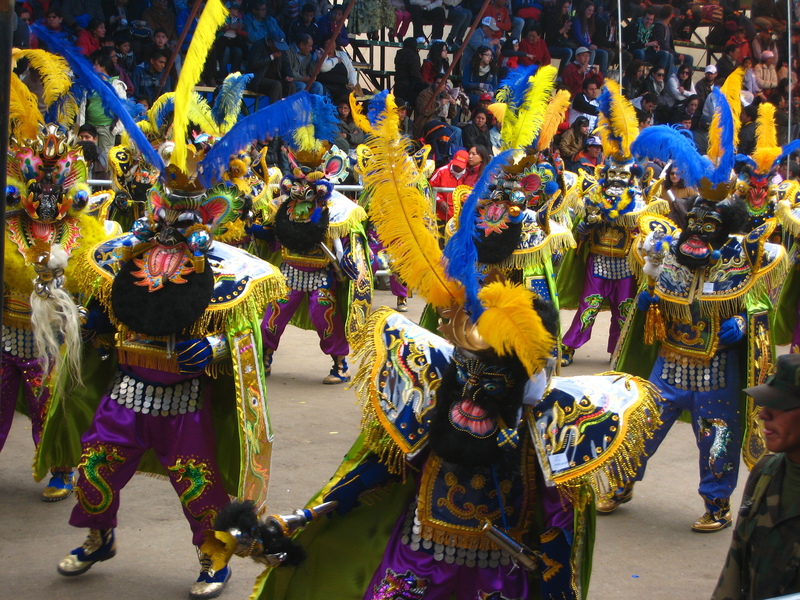 Dances include La Diablada (Dance of the Devils), Morenadas, Llameradas, Caporales and Tinkus. 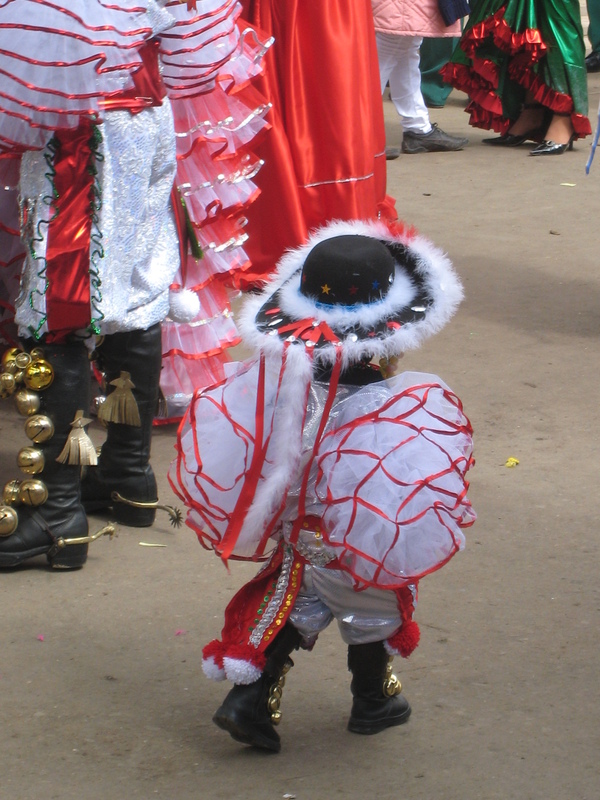 Every costume tells a story, with the predominant theme being good triumphing over evil. 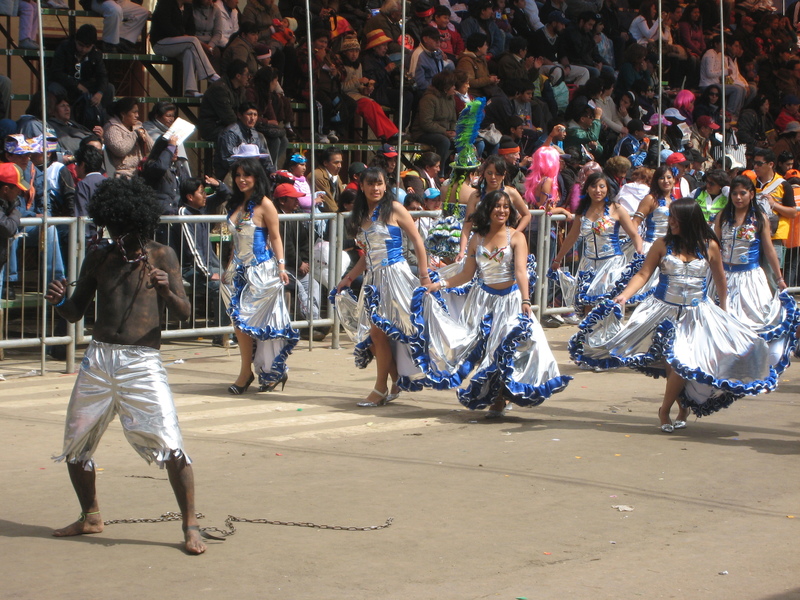 Somewhat disturbing was the black body paint and chains used in dances depicting the tribulations of African slaves, whom the Spaniards brought over to work in the silver mines. I honestly could not tell whether one of the dancers dressed up as a slave was a tremendous actor or genuinely lurching about looking distressed because he was heavily inebriated. Either way, it struck me as one of the more disconcerting dances. 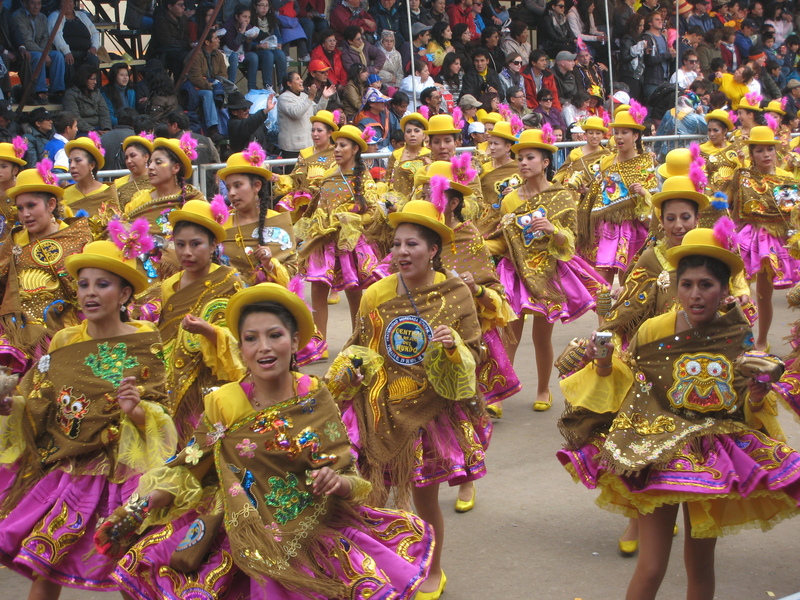 The costumes are incredibly ornate, adorned with jewels, feathers, mirrors, bells and spurs. 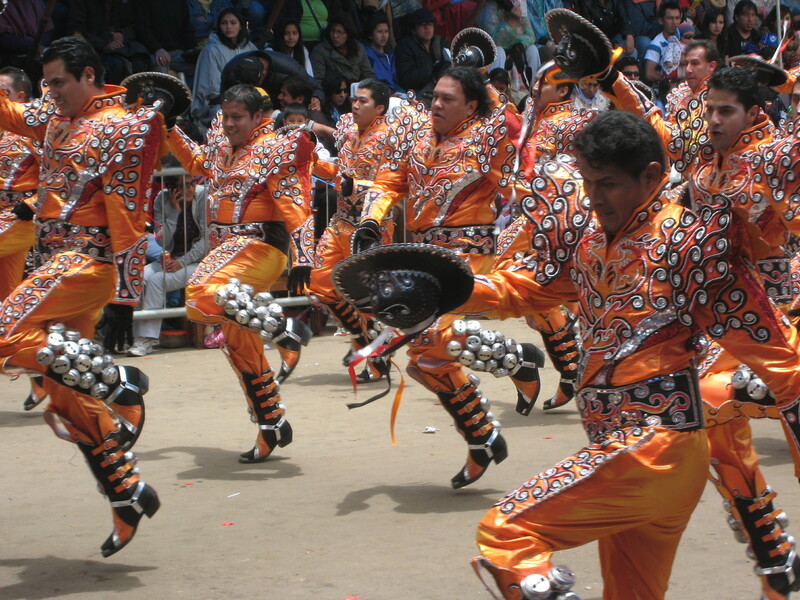 Some weigh up to 80 lbs, which makes the energetic jumping that some of the dances entail even more impressive. 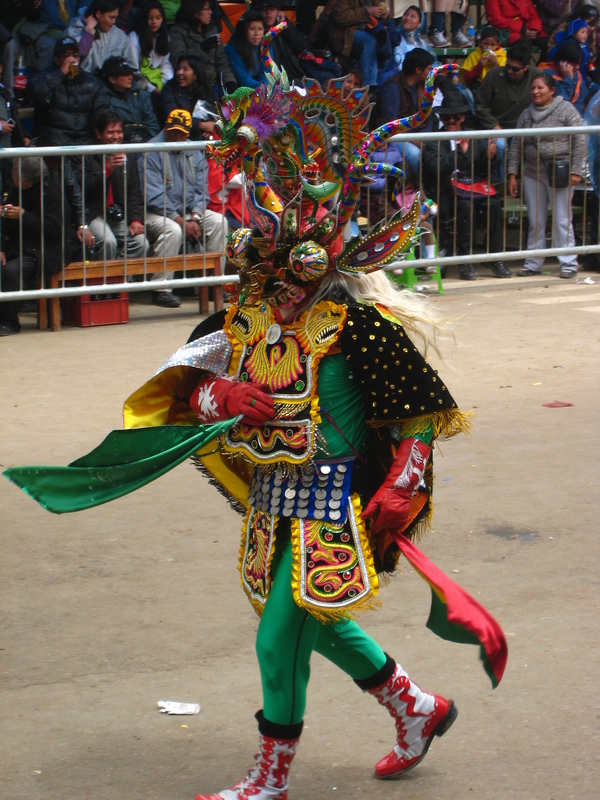 The Diablada costumes are particularly elaborate, their devil masks works of art with curved horns and bulging eyes. 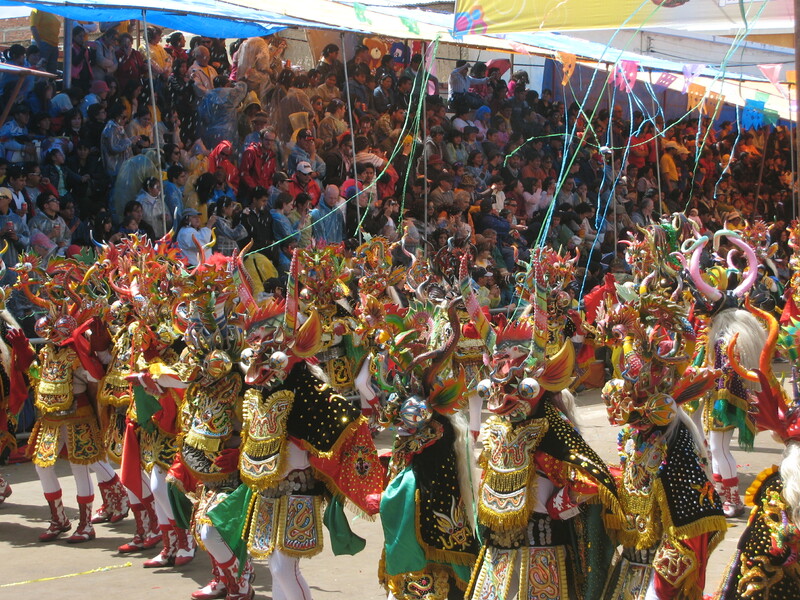 Live bands accompany the thousands of dancers, many exuberantly dancing as well as marching, crashing cymbals as they leap. 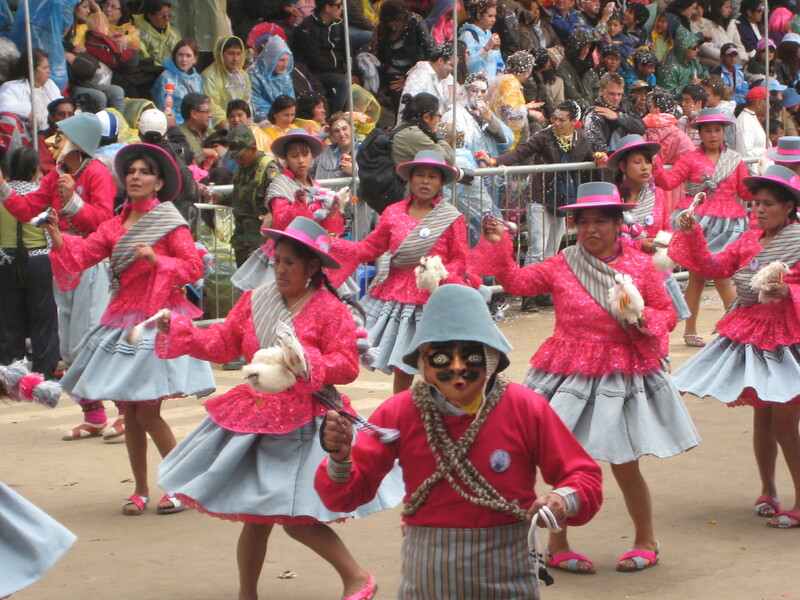 Rain ponchos are worn by most onlookers, since water balloons and spray cans of foam feature heavily in the festivities. People hurl water bombs across the processions into the facing crowds and douse each other with foam, tourists being the main target for both (my sneaky attempt to blend in with the locals worked remarkably well). 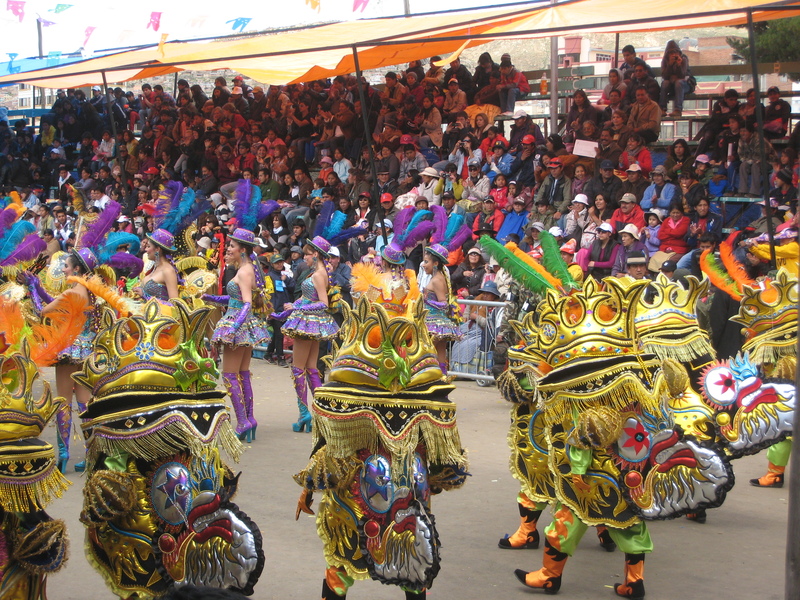 Although the celebrations continue for several days in Oruro, it is generally understood that the first day of Carnaval is the best, since the event descends into increasing rowdiness and mayhem. 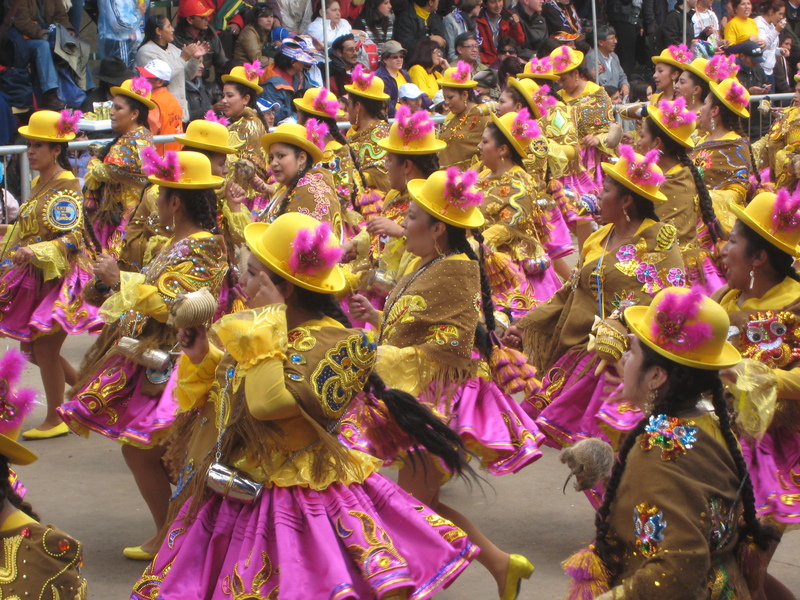 Dancers and onlookers consume huge quantities of beer and chicha (a very potent drink made from fermented corn), the dancing deteriorates with the debauchery and it is not uncommon to find people sleeping in doorways or the middle of the street. 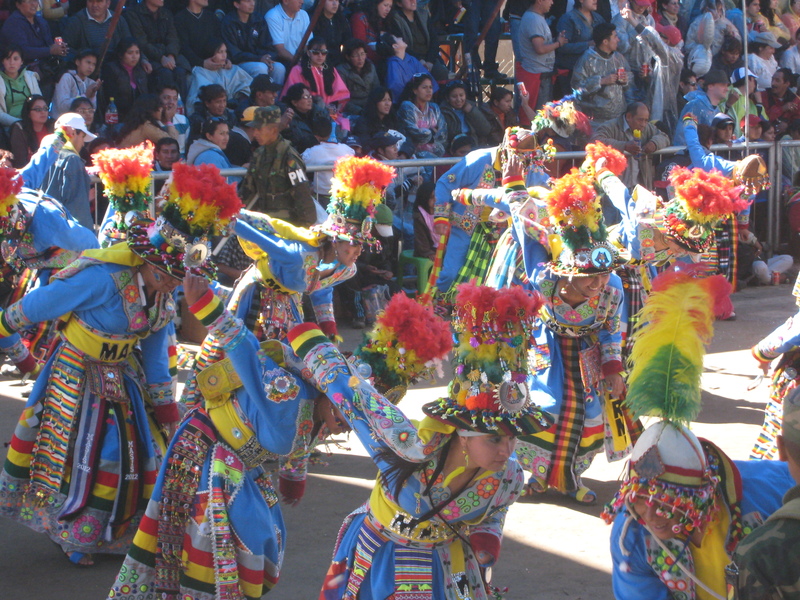 After a full day of spectating, I set off on another bumpy bus ride back to La Paz. 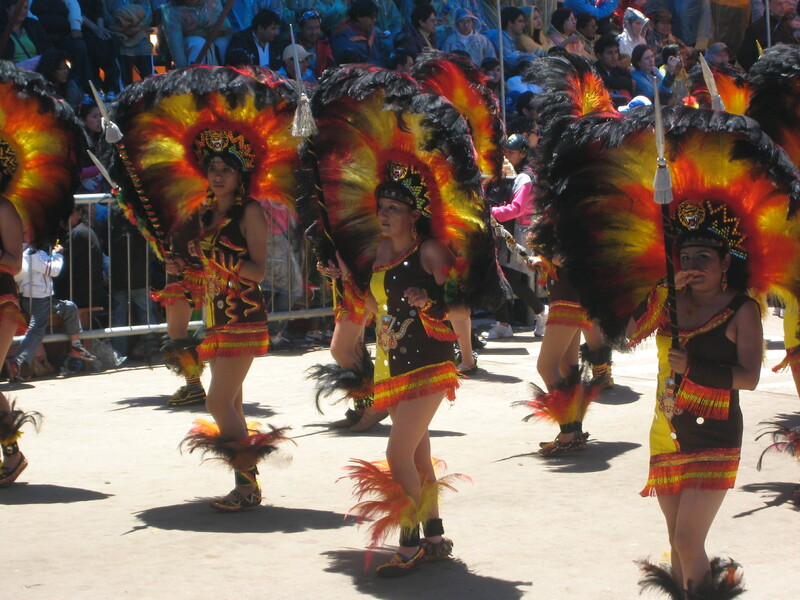 Having had my fill of Carnaval, I chose to forgo the remaining festivities in order to explore Chile during my days off. 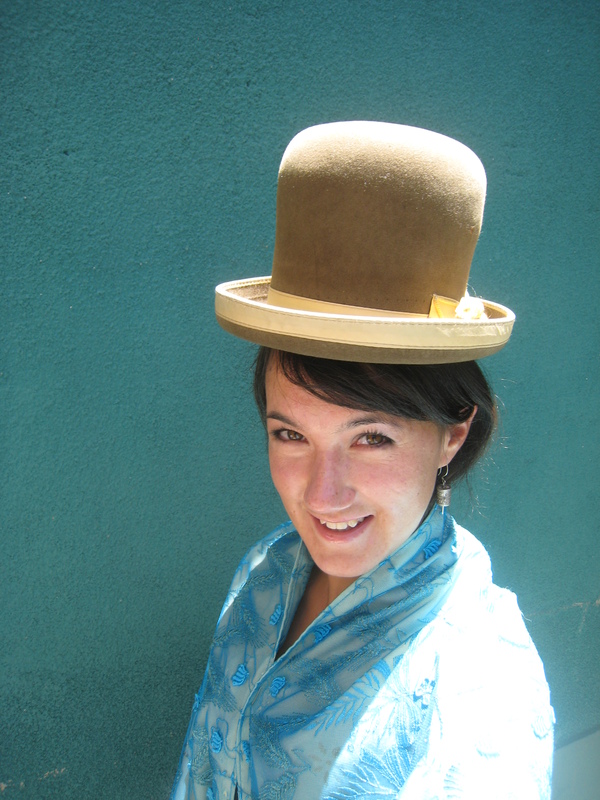 As requested, here is a photo of me in a typical Aymará bowler hat. Petro, the housekeeper, took great pleasure in dressing me up in her cholita attire, though she lamented my hair was not in the traditional two plaits (maybe next time). 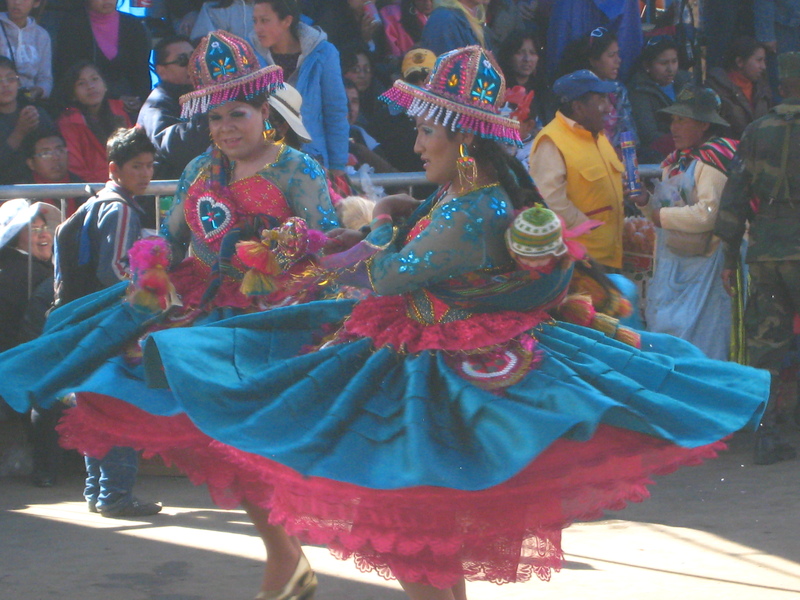 This entry was posted in culture, festivities, sightseeing, traditions and tagged Bolivia, bowler hats, Carnaval, ch`alla, dress, Oruro, Pachamama by Joni. Bookmark the permalink. That’s one beautiful ‘Jolita’. We love it! Made your dad’s day! Amazing photos as usual. They do! Thanks for following, Phyllis. Ha. Yes, that`s fair. I was also questioning my sanity, making the 4hr journey there and back in one day on a whopping 1 hr`s sleep.